As far as Premier League climaxes go, it wasn’t exactly up there with last year. 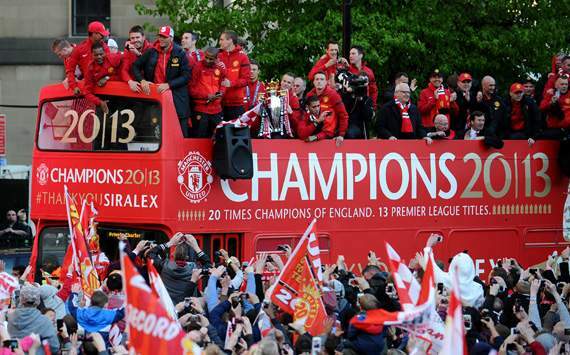 Manchester United reclaimed their trophy with four matches still to play. Arsenal made it over the line ahead of local rivals Tottenham Hotspur and ensured that England will be represented by the same four teams in the Champions League next term as it was this. Wigan Athletic’s defeats to Swansea City and the Gunners ended the relegation battle early and denied us the prospect of anything up to a ten-way, final-day decider. But there was still plenty to keep us excited throughout the season. Swansea and Wigan both picked up their first ever major trophies – the former beating League Two giantkillers Bradford City to lift the League Cup, while the latter became the first FA Cup winners to suffer the drop in the same campaign. Chelsea overcame a gruelling 69-game season to win the Europa League and become the first English side to lift all three major continental trophies. And, on a mental final day, Sir Alex Ferguson bowed out with the Premier League’s first ever 5-5 draw, away to West Bromwich Albion. 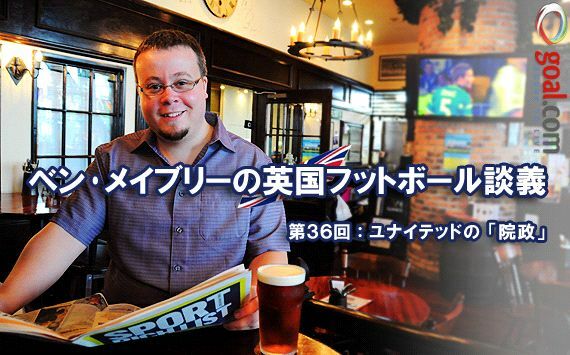 Read on for my winners and losers of 2012/13. The toughest decision comes in goal. Asmir Begović of Stoke City was the clear star man in the first half of the season and David de Gea of Manchester United in the second, but neither will especially enjoy looking back on the other 19 matches of their respective sides’ campaigns. In the end I’ve gone for the consistency of Chelsea’s Petr Čech. The signing of the season at just £2 million (£2 million?!) from Rayo Vallecano, Michu was an utter joy to behold – not only for his 18 goals but for the glorious, ghosting runs between the number ten and nine positions when afforded the opportunity to start behind the Swansea City front line. 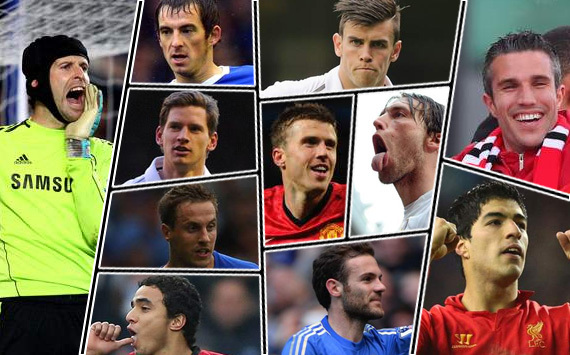 Otherwise, the differences from the PFA Team of the year come in defence. Rafael da Silva’s new-found maturity – his recent red card against Chelsea notwithstanding – sees him come in at right-back for Pablo Zabaleta, while Everton’s (for now?) Phil Jagielka edges Rio Ferdinand in the middle. Other honourable mentions must go to Santi Cazorla, Eden Hazard, Frank Lampard, Marouane Fellaini, Matija Nastasić, Gareth McAuley, and – for their tremendous performances since joining Liverpool in January – both Daniel Sturridge and Philippe Coutinho. A major issue with the PFA Player of the Year award is how significantly the vote appears to be influenced by its timing. The latest winner, Gareth Bale, was right in the middle of his terrific goalscoring purple patch as the nominations were cast this season while Robin van Persie, one of the two other leading candidates, experienced a sudden dry spell. Perhaps controversially, though, I am going to pick the third. On his day, when he happens to be in the right mood, Luis Suárez can be the biggest idiot in world football. The PFA ceremony came amid a ten-match ban that curtailed his season and will delay his next. 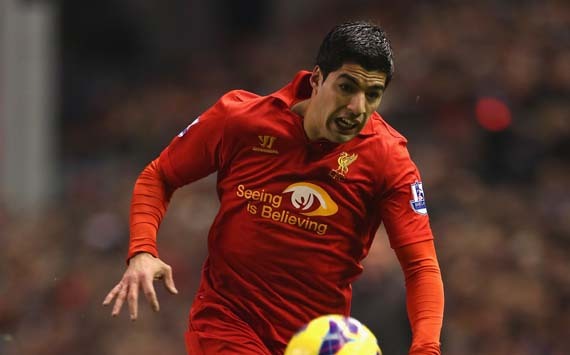 This is now his final chance – Liverpool must sell up if the Uruguayan ever disgraces the club’s name again. But it is in everyone’s best interests that that doesn’t happen. This season, Suárez has lit up English football to become one of its true stars, netting 23 times in the Premier League and 30 in all competitions. He began the campaign essentially doing all the goalscoring work for an entire front three, before the arrivals of Daniel Sturridge and Philippe Coutinho allowed Liverpool to better take advantage of his creativity and tireless movement to and from wider and deeper positions. It is hard to see the point of a player as established Gareth Bale being awarded the PFA Young Player of the Year award as well as the main prize – not least since he was overlooked for the former honour while winning the latter two years ago. Christian Benteke, on the other hand, has come fresh out of Belgian football to take England by storm. Having first made his name as a 17/18-year-old with 14 Jupiler Pro League goals for Kortrijk in 2009/10, the DR Congo-born hitman netted 16 in 32 league games for Genk last season and three in five at the start of this before a deadline day move to Villa Park. Benteke’s power, pace, and sheer confidence ensured that the step up to the Premier League was managed at a single bound. Aged 21 at the time, he scored on his debut against Swansea City and went on to register 19 in the league plus a further four in Aston Villa’s run to the Capital One Cup semi-finals. Even while the club struggled, his attacking play alongside Andreas Weimann and Gabriel Agbonlahor was simply explosive – not least during a 3-1 win at Anfield where Benteke scored twice either side of a back-heeled assist for the Austrian. Aged 71 – and after 26 and a half years, 13 Premier League titles, and 38 major honours – Sir Alex Ferguson bows out on top. On paper, Manchester United’s best eleven ought to have been bettered both by Manchester City and, arguably, Chelsea. Certainly, the playing resources at Ferguson’s disposal did not constitute a vintage by Old Trafford standards and they had no right to consider that a winning margin of fully 11 points could even be a remote possibility. For all the contribution of Robin van Persie, the difference that made United such comprehensive champions came in the dugout. While Roman Abramovich lost his nerve with Roberto di Matteo at Stamford Bridge and Roberto Mancini’s credentials slowly unravelled at Eastlands, Ferguson once again did what he does best – rising to the latest challenge in the most emphatic manner possible. Just as he had in 1992, 1995, 1998, 2002, 2006, and 2010, the Scot used the bitter disappointment of last season to instil a near-unstoppable winning mentality into his charges. Sometimes they had to come back from one or two goals behind, sometimes they left it late, sometimes they played poorly. But almost always, they won anyway. Ta-ra, Fergie. It is strange to think now that, back in August when sportswriters around the United Kingdom and the rest of the world wrote their season previews, a lot of people fancied Swansea City for the drop. The loss of manager Brendan Rodgers to Anfield, plus the departures of star players Joe Allen and Scott Sinclair was supposed to reduce the Swans to one-season wonders. Michael Laudrup arrived as a big name in the hot seat but with a coaching reputation that was, they said, unproven. Swansea won their first match 5-0 away to Queens Park Rangers and never looked back. 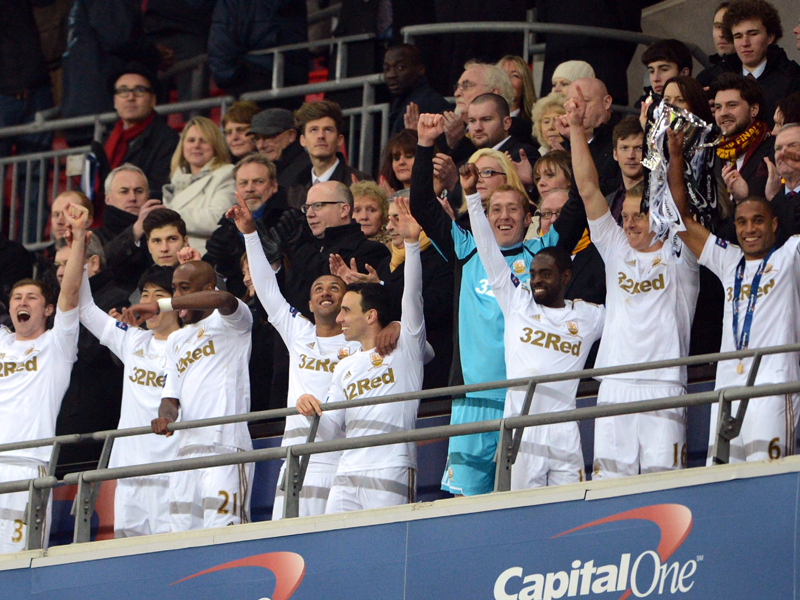 Michu sparkled together with other new signings such as Pablo Hernández, Jonathan de Guzmán, and Chico Flores. Ashley Williams was a bedrock at the back alongside the latter; Ben Davies stepped out of the youth team to replace the injured Neil Taylor and looked like he had been a Premier League player for years. Laudrup, it turned out, was the next logical progression within the club’s long-term model of sustainability. He added directness, flair, and versatility to make the side even more attractive, win their first ever major trophy, and finish in the top half. Given their status as the richest team in English football history, Manchester City’s Premier League title defence must go down as one of the lamest. Just as their neighbours’ successful campaign began the moment the previous season finished, City embarked upon their path of failure when they managed to spend the summer ensuring they would start 2012/13 with a weaker squad than before. Allowing Nigel de Jong to leave and replacing him with Javi García, at a net loss of almost £14 million, goes down as a shocking piece of business. The fired Roberto Mancini ostensibly retains the love of the City fans for bringing them their first trophy in 35 years and their first championship in 44, but perhaps also for reminding them of the self-deprecation that kept them going through the wilderness years. His man-management skills were exposed not only with the eventual departure of Mario Balotelli but also the public criticism of Joe Hart, plus several woefully undermotivated performances from the team as a whole and Samir Nasri in particular. In terms of tactical awareness, his ill-considered experiment with 3-5-2 was reminiscent of a teenager trying out different settings on the PlayStation. According to the Italian, it was never his fault. Now, it is no longer his problem. 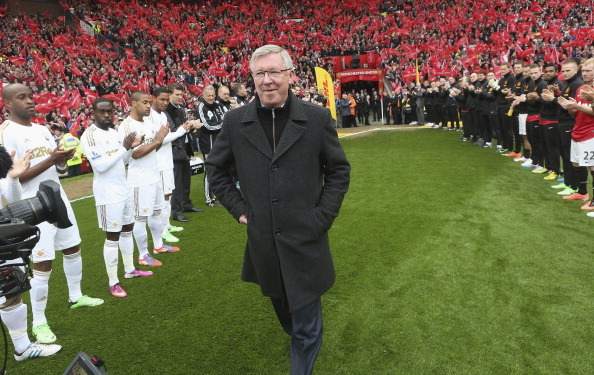 There is a strong sense this May that English football has reached the end of an era with a list of famous retirements including Paul Scholes, David Beckham, Jamie Carragher, Michael Owen, and – most significantly – Sir Alex Ferguson. For the first time, Manchester United will enter a Premier League season with a new manager. It will be the first time that any English champion has done so since Kenny Dalglish became director of football at Blackburn Rovers in 1995. Even more incredibly, each of this year’s top three – and four of the top six – will undergo managerial changes over the summer break as well. This presents us with greater unpredictability than at this point in any other year since the Premier League began. David Moyes’s United will likely begin next term as third favourites for the title, but how will the former Everton man seek to make his mark after he unofficially takes over at Old Trafford this week? Will José Mourinho negotiate a route out of Madrid back to Chelsea and, if so, can he carry on where he left off first time round? Will Manchester City look to Manuel Pellegrini, and possibly Isco, to recreate a bit of neighbourly racket? Given the size and success of the empire that Sir Alex Ferguson has built at Old Trafford over the past 26 and a half years, it was always a no-brainer that he would stick around to offer his expertise as club director and ambassador post-retirement. As such, it made perfect sense that his final task as manager of Manchester United was to choose a replacement. The new man would require the ability to carry on the 71-year-old’s good work plus the strength of character to work alongside him, and despite murmurs in France that Paris Saint-Germain boss Carlo Ancelotti had been sounded out too, from the start there were clearly just two strong candidates. 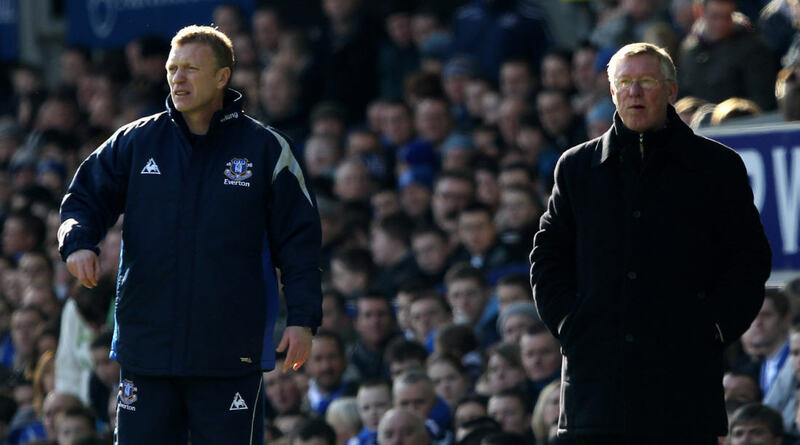 In the end, David Moyes was a vote for minimally disruptive long-termism over the brisk, brilliant, and brief love affair that José Mourinho would have promised. The concept of dictating one’s own successor while continuing to exert significant influence in the background thereafter is nothing new. For over a century in the late Heian Period, Japanese imperial authority was defined by it, as the insei system of cloistered rule saw a succession of emperors abdicate to ensure stability and consolidate their own positions of power. Ferguson would need to live to 113 in order to match the exploits of Emperor Shirakawa, who perfected the insei practice by surrendering the Kyoto throne to his son, Emperor Horikawa, in 1087 only to carry on pulling the strings as family patriarch for another 42 years until his death in 1129. But United need not look anything like as far, either geographically or historically, for a warning over the dangers of applying similar thought to football. It took the Red Devils a long time – many would argue until the appointment of Ferguson in 1986 – to emerge from the shadow of their former great manager, Sir Matt Busby. Taking the reins after the cessation of World War II hostilities in 1945, Busby narrowly survived the Munich air disaster that killed eight of his Babes in 1958 to rebuild and finally win his desperately-coveted European Cup ten years later, before retiring in 1969. But his continued presence in the corridors of Old Trafford and even on the touchlines of the training field as general manager served to overshadow his immediate successor, Wilf McGuinness, from day one. Aged just 33, the former wing-half was so stressed that he was well on the way to complete baldness by the time of his sacking in December 1970, with the team placed 18th in the old First Division. When Frank O’Farrell arrived as McGuinness’s permanent replacement in June 1971, he was asked to take a smaller office down the hallway as Busby was still yet to vacate the big one with ‘Manager’ written on the door. The former Leicester City boss refused, aware of the need to underline his own authority, but still found himself heavily compromised by the close relationship Busby enjoyed with the players who had brought him continental success. In an interview with the Daily Telegraph in 2011, O’Farrell complained, “He was always about somewhere where the players could find him. After one game, he told me I shouldn’t have dropped Bobby Charlton. Obviously he said the same to Charlton, because the player was moping round the place… Another time he told me Martin Buchan [O’Farrell’s first signing] was responsible for letting in all these goals, when it clearly wasn’t his fault. He was interfering.” The Irishman only lasted a season and a half, too, and though the club went back to Scotland for his successor, Tommy Docherty was unable to stop the rot and United were relegated to the second tier in 1974 – just six years after their famous 4-1 victory over Benfica in the European Cup final at Wembley. However, the good news for United fans today is that while Ferguson has always sought to maintain the traditions of Busby – such as attacking football, discipline, and youth development – and even enjoyed a close relationship with the man himself, latterly club president, until his passing in 1994, he has already demonstrated his preparedness not to repeat the mistakes of his old mentor. In effect, the process through which Busby unconsciously laid traps for his successors began with the tired and aging state in which he left the United squad. By contrast, Ferguson has continued to lay the foundations for the team’s future right up until the final years and months – with signings like Phil Jones and David de Gea, the development of players like Rafael da Silva and Tom Cleverley, and finally the deal for 20-year-old Wilfried Zaha to join from Crystal Palace next season. In a similar fashion, Ferguson knows that he must now step back and allow Moyes to be his own man. The 50-year-old carries with him an excellent reputation from 11 years at Everton – not least for the respect he commands from his players, his precise tactical awareness, and his ability to get the very best from a squad pieced together with very limited financial investment. There are clearly various concerns, too; from his inexperience in European competition or title races to a certain indecisiveness in the transfer market and a less than perfect record with strikers. The key for United’s continued success will be to develop an efficient relationship whereby Moyes can – and does – willingly call upon Ferguson’s wealth of knowledge to supplement the areas in which he is initially lacking without the threat of pressure coming the other way.